This was Amy B.’s first time at Cooking Club and she nailed it! The the crazy amount of food we had that night, it was the perfect introduction for Amy, who brought along her adorable daughter, Penny (who ate tons of noodles), and her friend, Robyn, who was passing through town. These steamed dumplings were so ridiculously good. 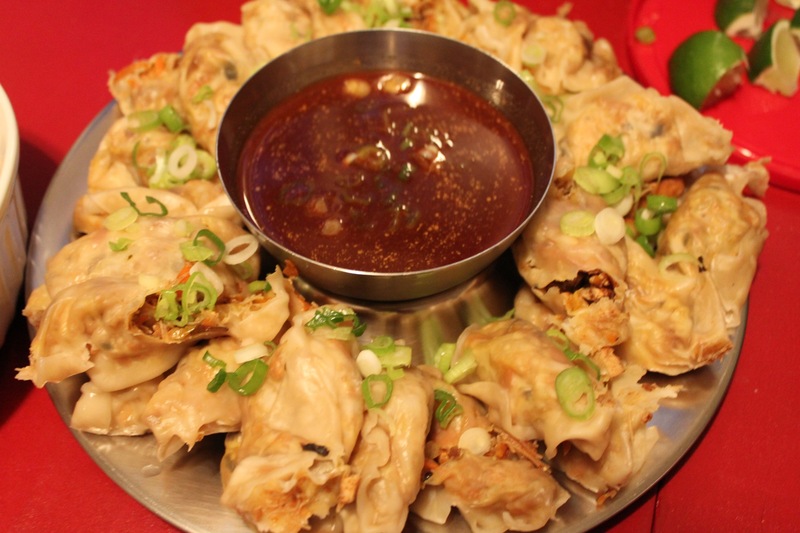 Asian restaurants around these parts are severely lacking in veg dumplings/potstickers. Seems they always have pork in them… Anyway, Amy said she was just winging it when she put this stuff together, so I imagine there’s some room for creativity here, whether you’re veg or eat meat. They were beautiful and delicious! 1. Chop, shred, mince, etc all veggies and set aside. 2. Heat up a few tablespoons of canola oil, in wok or large pan and stir fry tofu until slightly browned; set aside on paper towel. 3. In same pan add extra oil, if needed, and stir fry carrots, broccoli, cabbage, mushrooms, scallions, garlic and ginger until slightly soft (can add a bit of soy and rice vinegar to soften). Add noodles and hoisin sauce. mix until combined. taste to see if it needs more hoisin, soy or rice vinegar. Set aside to cool. 4. Assemble dumplings on cutting board. Place about 1 tablespoon of filling in the middle of wrapper. Wet finger with water and wet 2 sides (one corner) of wrapper. Fold wrapper diagonally and pinch sides so the dumpling is sealed; set aside on plate or tray lined with parchment. 5. In bamboo steamer or steaming rack, line with lettuce, bok choy, or any green you like! Place dumplings on greens and steam until wonton is transparent. You could also boil the dumplings or fry them. Top with sliced scallions to garnish! Start with soy sauce as base. add rice vinegar, chili garlic sauce, and mustard to taste. Entry filed under: Appetizers & Dips, cooking club, Recipes, Side Dishes, Uncategorized. Tags: dipping, dumplins, potstickers, sauce, shumai, soy, thai, tofu.